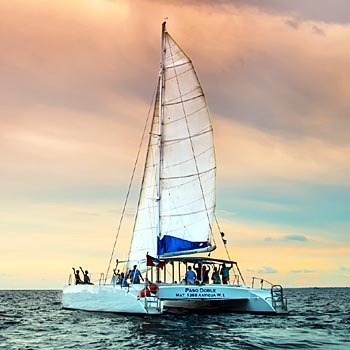 Private Catamaran Charters from Puerto Aventuras and Puerto Morelos, near Playa del Carmen. Live Romance. Love Paradise. 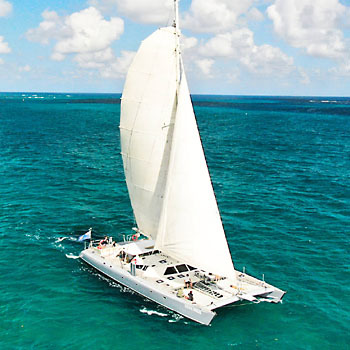 Sail with Paradise Catamarans. Why are We Top-Rated on the Mayan Riviera? There's a reason Paradise Catamarans is the top-ranked private charter service on the Mayan Riviera year after year. In fact, there are many reasons. Our deep love and appreciation of our planet, our country, our work, and, above all, our guests. We love what we do, and it shows in our dedication and attention to detail. Serving our guests as they celebrate the special moments of life isn't a job. It's an honor. Charter one of our catamarans for a private excursion, and in return we'll help you create memories to last a lifetime. We specialize in weddings, bachelor and bachelorette festivities, rehearsal and ice-breaker parties, anniversaries, family reunions, corporate events, memorial services, and other special occasions. We were the first tour operator on the Mayan Riviera to devote their business solely to conducting private cruises. No one else does it better. Whether you're looking forward to snorkeling, swimming, soaking up the sun, or admiring the sunset on the Mexican Caribbean, we promise you an adventure to remember. Docked in the Puerto Aventuras marina (about 15 minutes south of Playa del Carmen and 30 minutes north of Tulum), with a length of 46 feet and a capacity of 50 guests (40 for sunset and 6-hour tours). Complimentary drinks and healthy snacks included. Docked in El Cid marina, Puerto Morelos (roughly midway between Playa del Carmen to the south and Cancun to the north), with a length of 75 feet and a capacity of 80 guests. Complimentary drinks included. Excellent Service: Our employees love what they do and it shows in the service they provide! Safety: Although our end goal is to provide a memorable experience, we put safety first above all else. Environmental Awareness: In order to preserve and protect our beautiful oceans, we keep the environment in mind in everything we do -- by using plant-based disposable dinnerware and cups from Ecoware™ and biodegradable cleaning products. "Didn't think y'all could top our last trip but you did (Cypress, TX)." Visit our FAQs section for more answers to frequently asked questions about booking your tour in the Mexican Caribbean.